A new 2.4-liter will power the Accord. TOKYO -- Pledging that his company will have "the No. 1 fuel economy in each [vehicle] category within the next three years," Honda Motor Co. CEO Takanobu Ito unveiled a lineup of redesigned four- and six-cylinder engines and a family of continuously variable transmissions. The engines will start arriving in Honda vehicles next year. All will be offered by the end of 2013 in at least one Honda vehicle. The engines, which will be promoted under the Earth Dreams brand, have direct injection and double-overhead cams. 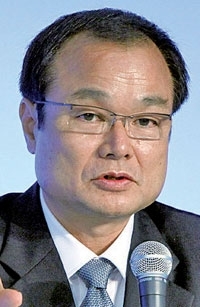 Some vehicles now on the market could receive the new engines mid-cycle, before the vehicles receive full redesigns, said Keiji Ohtsu, a chief engineer with Honda R&D Co. But some current Honda vehicles could keep their base single-cam four-bangers as a cost-saving measure until they get a full redesign. "We could be first in the marketplace" for fuel economy, said Tetsuo Iwamura, president of American Honda Motor Co. "That could bring the Honda name back up." -- A 3.5-liter V-6 with 310 hp and 265 pounds-feet of torque. This is 30 more horsepower and 11 more pounds-feet than the outgoing 3.5-liter engine in the Acura TL. But the V-6 will retain a single-cam setup. -- A 2.4-liter inline-four with 181 hp and 177 pounds-feet of torque. This will be the base engine in the redesigned Accord coming next fall, and could find its way into the mid-cycle change for the CR-V in 2013. -- A 1.8-liter inline-four with 148 hp and 133 pounds-feet of torque, which could be installed in the 2013 midcycle change for the Civic. -- A 1.5-liter inline-four with 127 hp and 111 pounds-feet of torque for the Fit, perhaps in time for the mid-cycle change in 2012. -- A 1.6-liter turbodiesel that has comparable power to a current 2.2-liter diesel, with 220 pounds-feet of torque, but much better fuel economy. Sources say this engine likely will come to the United States in addition to its traditional European application. Ohtsu said the power figures were preliminary and likely understated. Compared to the current four-cylinder engines, each of the new designs will carry at least a 10 percent fuel economy advantage. In addition, Honda has designed three new continuously variable transmissions, one for mid-sized cars such the Accord, and two for smaller vehicles such as the Civic, Fit and Japan-market minicars. Honda is betting big on CVT technology, and will use it as its base automatic transmission offering across all four-cylinder engines. Current CVTs have a "rubber band" feeling similar to a slipping clutch under acceleration, but the Honda system has less of a feeling of slippage, said Hideki Wakamatsu, general manager of Honda R&D. That's because the Honda belt is thinner and has a proprietary material that resides between the element and the ring of the CVT, Honda said. Also, the engine control software has been remapped so there is less hunting between the engine and CVT for optimal engine revs and transmission ratios during sudden acceleration, Wakamatsu said. A brief test drive around Honda's Motegi test track showed that the Honda CVT has a much more precise feel, with less response lag from the CVT when demanding more engine power, than competing models. Honda will continue to offer manual transmissions for markets such as Europe that prefer stick-shifts. And traditional stepped-gear automatics will be offered for vehicles such as sport sedans and sports cars where more immediate performance impact is needed, Wakamatsu said. On the hybrid side, Honda's upcoming Accord two-mode hybrid, when teamed with a four-cylinder engine, will have power equivalent to the Toyota Camry Hybrid, but better fuel economy than the Camry's 41 mpg combined rating, said Yusuke Hasegawa, senior chief engineer with Honda R&D. 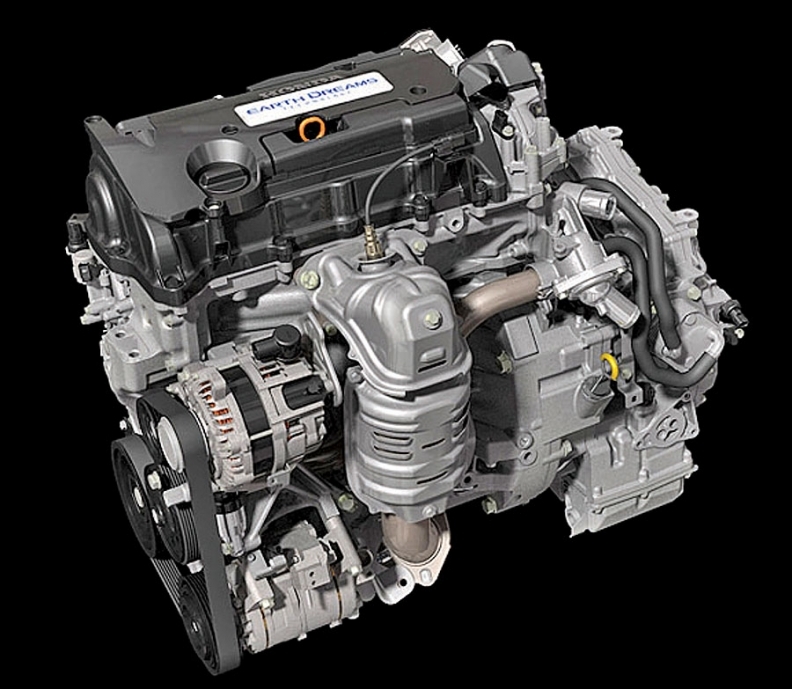 When teamed with a V-6 engine, the hybrid system will create V-8 power and four-cylinder fuel economy, Honda said. The system can run in electric-only mode, electric-and-gas for passing and acceleration, or gas-only for highway cruising. The two-mode hybrid uses a twin-cam profile. But instead of using its VTEC variable valve-timing technology for more power, the hybrid version shifts between the Atkinson cycle, for leaner-burning of fuel, and the traditional Otto cycle when more power is needed, depending on the torque load on the engine, Hasegawa said. The Honda plug-in hybrid can travel in electric-vehicle mode for up to 15 miles at speeds up to 62 mph. The plug-in system has a switch that will allow the driver to save EV-mode ability until later in his drive -- for example, when his commute begins on the highway and ends in stop-and-go traffic.